We left Jasper around 6 pm- 90 minutes late. On board were 80 mostly retired railroaders who travel on this train every February during the full moon. They come from across the United States and Canada and it has become a sort of reunion for them and for some of their wives. We may have left late, but we pulled into Winnipeg the next night two hours early. There was some suggestion that the dispatcher was doing his best to impress. It worked for us! We woke up to a grey day and a flat landscape- Saskatchewan. 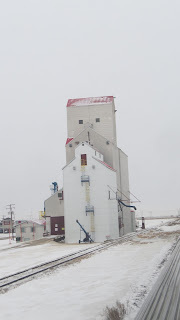 And a few iconic grain elevators by the tracks. It really is a bit of history to see these - at one point in time they were every 10 miles or so as that was as far as the farmers could efficiently haul their grain. And the train stopped by each one to load up. 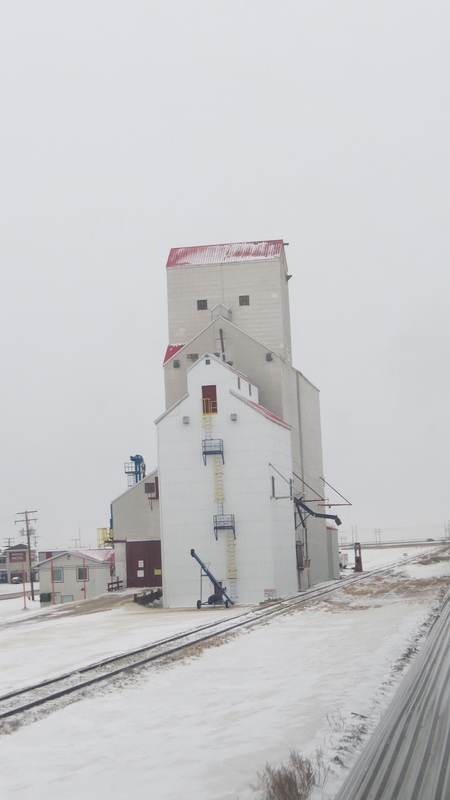 Initially grain was simply shoveled into box cars. The car we were on has recently been refurbished and was very elegant and efficient. Except whoever had designed the washroom never attempted to wash his face in the 6" wide sink. And Manitoba - again the weather was not kind to us. The old telephone poles along the track are also a sign of a bygone era - these were so important, both to the railway and dispatching, but also to the population along it. And now we have our satellites and wifi (although not on the train). The last morning we awoke in northern Ontario with the sun shining the whole day. The train we were on is the VIA Rail Canadian Streamliner - built in the 1950s and has the dome car for sitting up high to watch the scenery. With the train execs on board, several extra cars and 2 more dome cars were put on. And our arrival into Toronto. We spent a few hours at the station before boarding our train to Montreal. It was a lovely slow way to travel - to meet people and to read and knit. The food in the dining car was excellent and service throughout was great.